South African Airways has become the latest carrier to join the embrace of the Gulf carriers, signing a codeshare agreement with Etihad which adds 22 new codeshare connections between Africa and the Middle East and follows another important codeshare agreement with India’s Jet Airways. The agreements mark a shift for cash-strapped SAA towards recognition that as an end-of-line carrier it must develop a more virtual long-haul network. Such partnerships are part of SAA’s long term turnaround strategy and allow the carrier to extend its network without the need to commit capital to expensive long-haul aircraft. SAA acting CEO Nico Bezuidenthout said the codeshare agreements would grow the carrier’s revenue, with initial expectations that the Etihad partnership would add about ZAR100 million (USD11 million) a year to revenue. Meanwhile Etihad will increase its already comprehensive African coverage with the addition of SAA which improves access to the continent’s biggest economy. Etihad Airways and South African Airways (SAA) signed an MoU on 06-May-2013 allowing the two airlines to introduce a comprehensive range of codeshare and interline air services as well as explore synergy and efficiency opportunities. Under the initial codeshare agreement Etihad will place its EY code on 10 SAA routes from Johannesburg to destinations across South Africa and the African continent as well as South America. Destinations that will be operated by SAA metal include Johannesburg to Cape Town, Durban, East London and Port Elizabeth, as well as to Livingston, Lusaka, Ndola, Harare, and Victoria Falls. 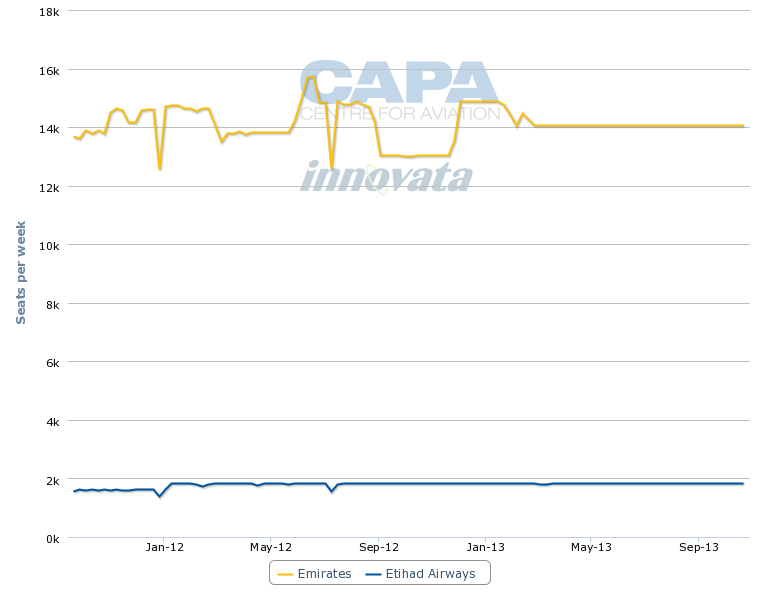 Outside the African continent Etihad Airways will place its code on SAA’s flights to Sao Paulo. Currently Etihad operates directly to seven continental Africa destinations, including Johannesburg, Nairobi, Khartoum, Lagos, Cairo, Tripoli and Casablanca. South African Airways will take advantage of Etihad’s extensive Middle East and Asian networks by placing its SA code on Etihad’s flights between Johannesburg and Abu Dhabi, as well as on 12 routes on Etihad’s global network beyond Abu Dhabi, including to Shanghai, Kuala Lumpur, Bangkok, Singapore, Colombo, Bahrain, Kuwait, Muscat, Jeddah and Istanbul. SAA flies direct to Hong Kong four times weekly with its own metal and Beijing three times weekly, but has no presence in the Middle East. The Etihad codeshare routes will improve South Africa’s links to those high growth regions. 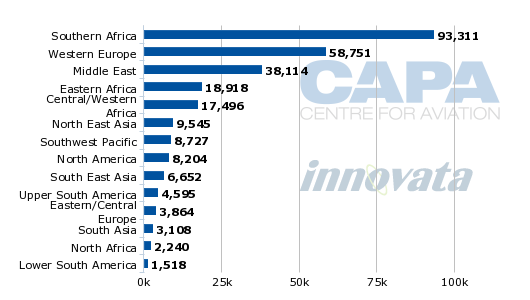 Nearly 400,000 visitors from wider Asia arrived in South Africa in 2012, but a quarter of those were in transit. China is the biggest single Asian market with a total number of arrivals of over 132,000. The country accounted for 14.3% of South Africa’s estimated USD106.8 billion in imports in 2012. Some 40,700 visitors from the Middle East arrived in South Africa in 2012 with 34,000 of them as tourists. The biggest inbound market was Israel with about 20,600 visitors, followed by 5,300 from Saudi Arabia, about 3,300 from Lebanon, 1,800 from Jordan, and nearly 1,200 from the United Arab Emirates. Etihad’s service to Colombo will support SAA’s own daily flights from Johannesburg to Mumbai and will supplement the codeshare with Jet Airways which will provide access onward connections to five domestic points in India. Etihad has applied to buy a 24% stake in Jet Airways as part of a deep alliance between the carriers. Some of SAA’s Asian codeshare routes will compete with existing non-stop services to Johannesburg by Cathay, SIA and Thai Airways. Turkish Airlines also operates direct daily A330 flights from Istanbul to Johannesburg and on to Cape Town. No European destinations are included in the agreement. SAA and the South African Government have long been vocal critics of the Gulf carriers, arguing that they have dumped too much cheap one-stop capacity to Europe via Dubai, significantly undercutting fares for direct services. China has also become South Africa’s fourth biggest overseas tourism market, growing 56% to more than 132,000. Asia arrivals overall were up 34%, helping to boost South Africa’s tourism numbers by 10.2% in 2012 to nearly 9.2 million visitors. Visitors from Europe were up 9.5% to 1.4 million with the UK accounting for nearly 440,000, up 4.2% on 2011 and remaining South Africa's biggest single source market. 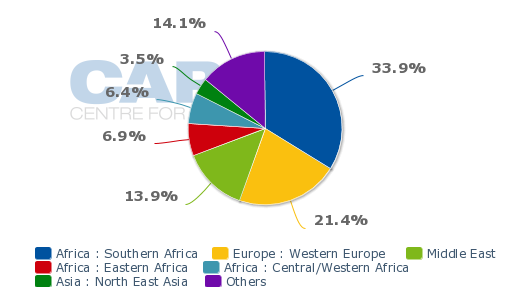 Western Europe is South Africa’s largest market after Southern Africa with about 58,700 seats per week, followed by the Middle East’s 38,100 seats. Asia accounts for a total of about 19,300 seats per week of which the Northern Asian region is the largest with about 9,500 seats per week. Etihad has a well-honed strategy of working closely with partner airlines to serve secondary cities in a market. The carrier has 43 partnership agreements including equity investments in airberlin, Air Seychelles, Virgin Australia, Aer Lingus and Jet Airways. The agreement with SAA will extend Etihad’s footprint in the strategically critical African market which boasts seven of the fastest growing economies and has a rapidly growing trade with Asia. Etihad flies seven times weekly between Abu Dhabi and Johannesburg offering a single flight on Monday and twice daily services on Tuesday, Thursday and Saturday. Alitalia, airberlin, SriLankan Airlines and Olympic Air also codeshare on all or some of the services, according to Innovata. SAA and Etihad passengers will be able to earn and redeem frequent flyer benefits through their respective programmes under the agreement. The two carriers will also seek to expand the cooperation agreement, including codesharing to more cities, closer synergies and efficiencies in areas such as procurement, maintenance opportunities, ground handling as well as training to drive incremental revenue opportunities. Collectively the two airline groups expect to carry more than 20 million passengers in 2013. Etihad president and CEO James Hogan said the, “multi-layered, partnership will enable Etihad Airways and South African Airways to achieve significant goals in several different global markets as well as collaborate on a number of key commercial initiatives”. SAA says its existing codeshares with Emirates on the Johannesburg-Dubai route will not be affected by the Etihad agreement. Emirates operates three times daily between Johannesburg and Dubai with Boeing 777-300ERs. 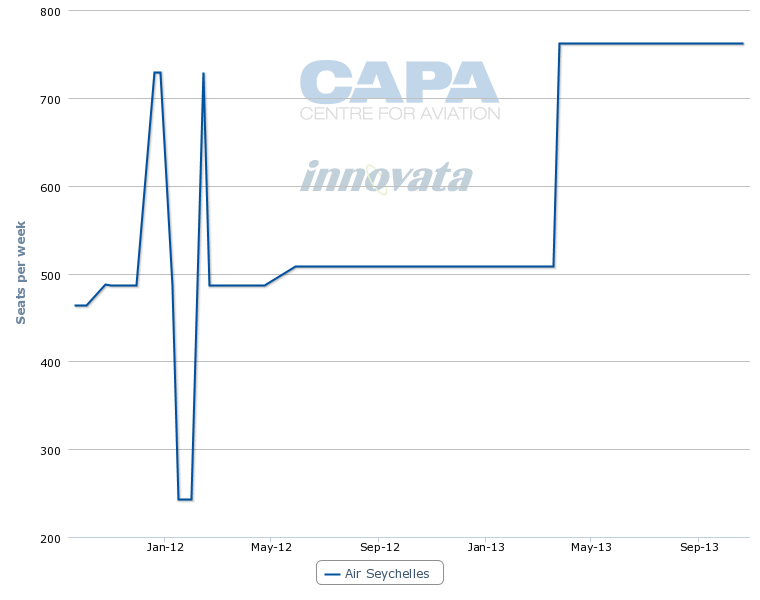 The deal with Etihad follows SAA signing codeshare agreements with Air Seychelles and Jet Airways in Apr-2013. SAA reached a codeshare agreement with India’s Jet Airways on 17-Apr-2013 which will significantly increase its access to that important market. Under the agreement, SAA, the only airline with nonstop service between Johannesburg and Mumbai, will codeshare on Jet Airways’ operations between Mumbai and Delhi, Bangalore, Hyderabad, Chennai and Thiruvananthapuram. In turn, Jet Airways will add its 9W code to SAA’s daily A330-200 services between Mumbai and Johannesburg and beyond to Cape Town and Durban. SAA also codeshares with Air India on the Mumbai-Johannesburg route. Nearly 1.3 million people of Indian or Asian decent live in South Africa. Tourism arrivals from India have grown steadily over the past eight years, gaining another 18% in 2012 to 106,774, making India South Africa’s eighth largest overseas source market. SAA acting GM commercial Manoj Papa said: “In essence, the agreement further supports the objectives of the BRICS member states". 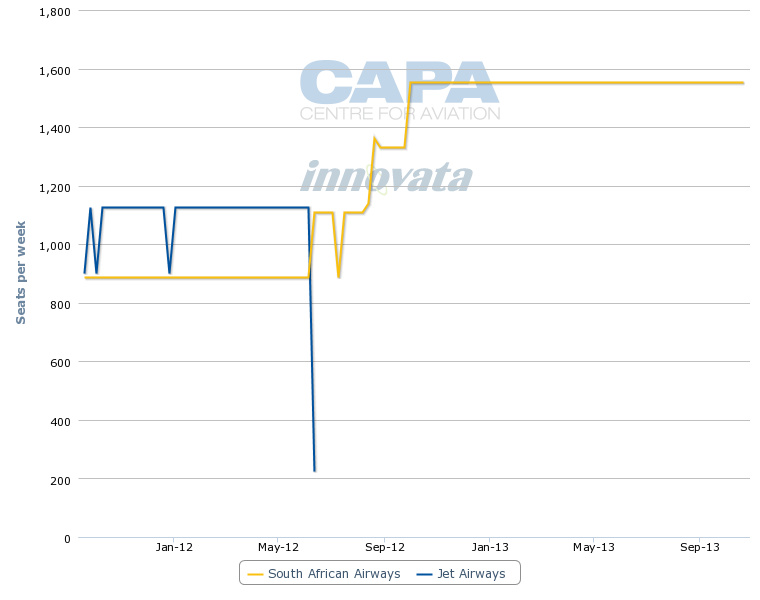 Jet Airways ceased operating to South Africa in Jun-2012, allowing SAA to increase capacity to just over 1,500 one-way seats per week. South African Airways and Air Seychelles entered a codeshare agreement on 25-Apr-2013 initially covering Air Seychelles' Johannesburg-Mahé service which became effective on 30-Apr-2013. The airlines plan to expand the agreement to include Air Seychelles' Mahé-Praslin service, SAA's South African domestic services and frequent flyer programme reciprocity, subject to regulatory approval. The agreement takes advantage of strong growth in traffic between South Africa and the Seychelles for both leisure and business travel. South African visitor numbers to the Seychelles increased 50% between 2009 and 2012 to 12,351. Etihad is rapidly expanding its codeshare reach into Africa, adding Kenya Airways as a partner in Feb-2013 in addition to existing agreements with Royal Air Maroc, 40%-owned Air Seychelles and TAP Portugal. Etihad will place its EY code on Kenya Airways’ flights from its Nairobi hub to 27 destinations across Africa. The partnership with SAA will bolster Etihad’s Southern Africa coverage, adding services to Zambia and Zimbabwe. Kenya Airways will also place its KQ code on Etihad’s daily service between Nairobi and Abu Dhabi, and onwards to 32 destinations on Etihad’s global network. The agreement provides Kenya Airways with onward connections over Abu Dhabi to destinations across North Asia, Southeast Asia, the Indian sub-continent and Australia, where it replaces a previous arrangement with Qantas - cancelled as a result of Qantas’ alliance with Emirates. SAA has struck two valuable alliances with Etihad and Jet Airways which will significantly enhance its east-bound network, giving some preliminary insights into the airline’s strategic direction under a long term business plan that has been submitted to the government for approval. The challenge now is to find a European partner able to support its largest market, but where SAA has been forced to reduce capacity. An expansion of existing codeshare agreements with fellow Star Alliance members Lufthansa, SAS or SWISS would appear to be the most likely option. But then again in a world where the old order of global marketing alliances is increasingly making way for individual partnerships that best suit specific geographic and marketing goals, other options may present themselves. SAA appears to have recognised the value - or inevitability - of this more egocentric model by agreeing to work with Etihad and Jet Airways.